CHECHNYA is located in the Northern Caucasus on the geographical border between Europe and Asia and the religious border between Islam and Christianity. 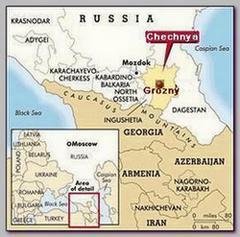 Chechnya stretches on about 15,000 km with only about 1 million inhabitants – most of them Sunnite Muslims. Like all nations and communities in the Caucasus, as well as in other mountainous areas in the world, the Chechens have long historical rivalries with its neighbors in the Caucasus. Chechens fought against the Russians from 1834 until 1859 but were, eventually completely occupied by the Russians with the help of non Muslim Chechen tribes loyal to the Russians. Since 1859 up to 1991 Chechnya was a coherent part of the Russian empire or its successor, the Soviet-Union. Chechnya always opposed Russian rule and was a source of violence in the Caucasus. Under Stalin dictatorship, in the 30s’ the Russians formed a combined Chechen-Ingushetia autonomy in the Caucasus. When the Germans approached the Caucasus, in 1942, the Chechens, once again, rebelled against the Russians, although there is no proof that there was a substantial coordination with the approaching Germens. In response the Russians deported in 1944 all the Chechens and Ingushetians to Kazakhstan and the region went through political Russification of the language and population. In 1956, during Nikita Khrushchev period, the Chechens were allowed to return to their homeland. About million Chechens returned to Chechnya with a deep hate to the Russian nation and the Russian regime. The daily friction with the new Russian population enhanced, even more, the tension and historical hostility between Russians and Chechens. When the Soviet-Union collapsed in 1989 the Muslim nations of central Asia became independent States. Almost from the beginning of the 90s’ Chechnya was transformed to a base of anti Russian violent activity. At the beginning, when Russia shrank to 17,000,000km and suffered from chaos, economical crisis and corruption the former mighty Soviet-Union was forced, in 1996, to a sort of compromise with the Chechens and recognition of their autonomy in Chechnya. Only in 2000, when Russia recovered, President Putine ceased the opportunity of a series of Chechen terror attacks to renew the war with the Chechens, to reoccupy Chechnya and to set up a pro Russian local regime. The war was followed by unimaginable atrocities and large scale terror attacks. According to British intelligence’s estimate between 30,000 up to 60,000 Chechens were killed – at least 3% of the population, in the bloodshed. The Chechen cause inflamed and united the Muslim communities all over the world. Although the Russian Army managed to overcome the Chechen resistance Chechnya is still an open wound, a source of tension with the Muslim World and with potential to erupt again. Lucky for Russia, operation Absolute Justice in Afghanistan in 12/2001 and the War in Iraq, which breached out in 03/2003 diverted the Islamic Global Jihad and the attention of Muslims from the war in Chechnya, which became a neglected, forgotten war.